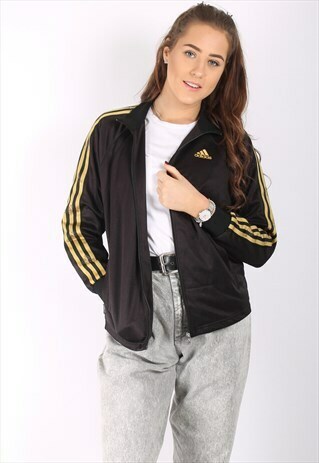 This Salvaged garment is a 100% vintage 1990s Adidas track jacket in black with shiny gold striped and embroidered logo. Printed logo on back. CONDITION - Excellent vintage condition, may be some natural signs of wear due to age. SIZE - Model is a size 10 and 5'10". Garment size up to UK 12 dependent on fit desired. Pit to pit 21" 52cm / Length 23" 58cm / Pit to cuff 20" 51cm. DELIVERY - Next day delivery available Monday-Thursday on orders made before 1pm. Orders made on Friday will be posted on Monday. Model is a size 10 and 5'10". Garment size up to UK 12 dependent on fit desired. Pit to pit 21" 52cm / Length 23" 58cm / Pit to cuff 20" 51cm.